Having spent a lot of time in the garage this past weekend, I finally took a good look around the place. This is the one room that HandyMan was left on his own to 'decorate', and I have to admit, he's done a really good job. Aesthetically, the place is fine, all wood and... sawdust. Functionally though, the place is just awesome. 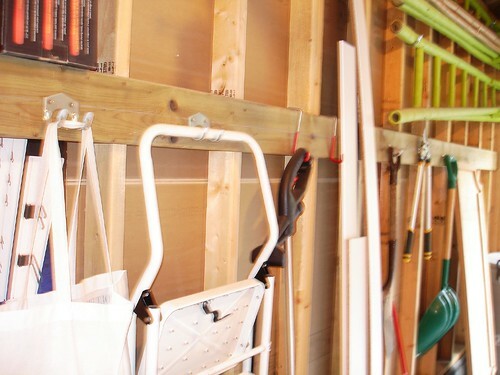 HandyMan has a few organizing tricks up his sleeve. Like those shelf brackets above. 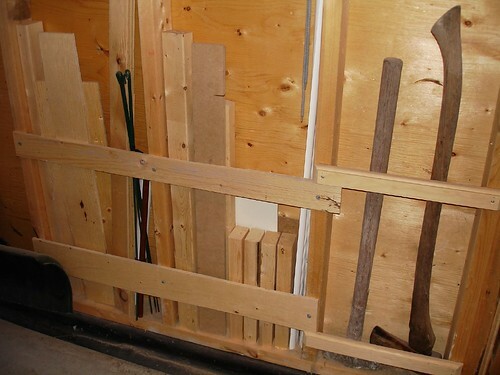 See how he's stored the extra 2x4s on them? They're both secure and accessible. He's put other wood odds and ends up in the open rafters too. 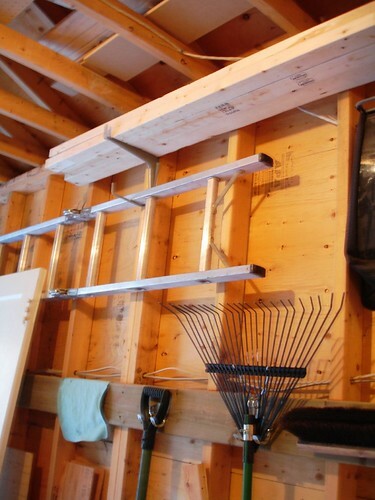 You'll notice everything is off the floor... ladders, shovels, hedge trimmers, apple green bamboo ladder (what?! ), rake... everything has a home. 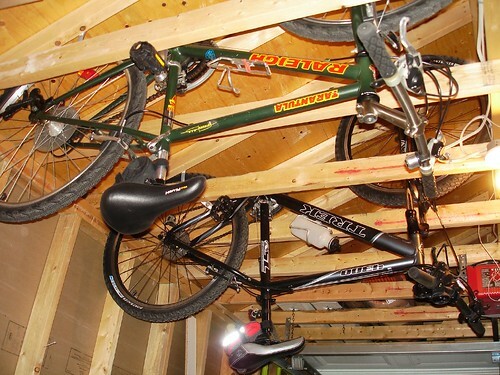 Even our bikes are tucked away - up overhead hanging from the rafters. I like how he's made use of the entire space too. 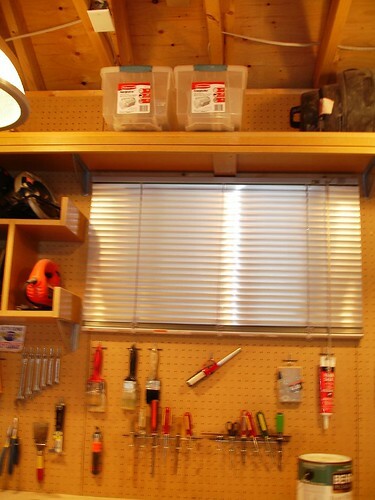 The whole back wall is lined with pegboard. 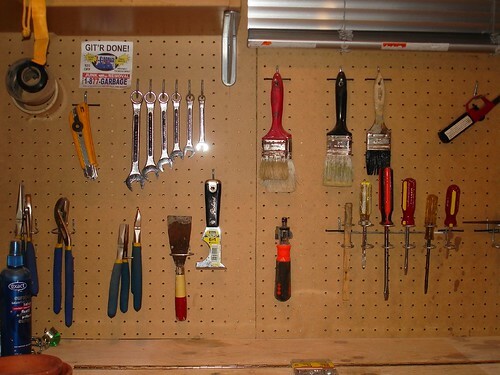 (If you ever want to see your husband giddy as a schoolgirl, just give him some pegboard, a few hooks, and some hand tools to play with!). 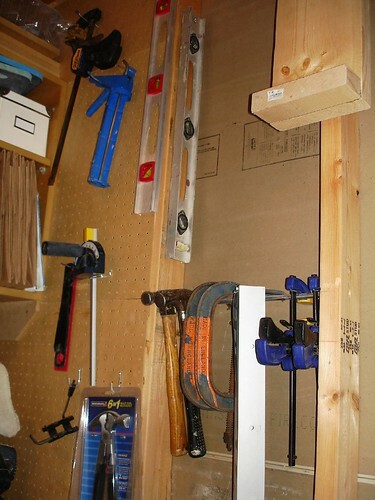 There's cubby holes above for small tools and shelves below with enough space for the big toys - I mean tools ;). 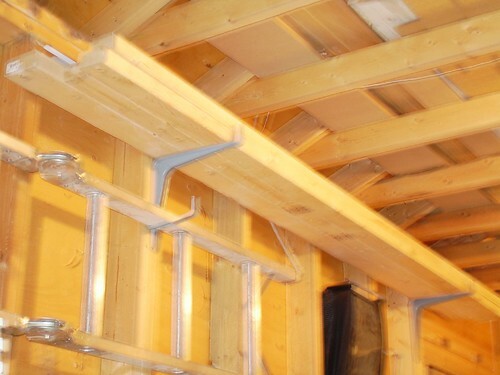 And see that metal rod hanging on one of the walls between the studs? HandyMan put that up specifically so he could hang hammers and clamps off of it. That boy is genius, I tell you. This little section above is one of my favourites. A few strips of wood were attached across some studs to create a little niche for smaller wood pieces. Now that we have the spray paint gun, HandyMan also came up with the brilliant idea of how we can turn our garage into a paint shop. 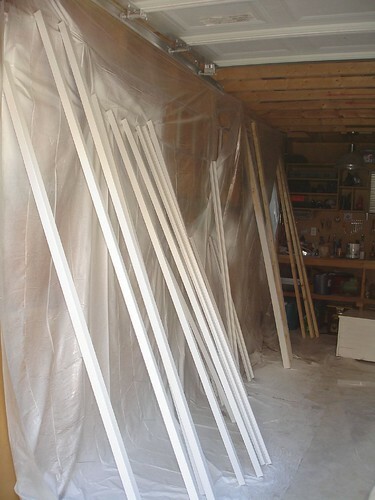 He stapled some plastic dropsheets to the wall header along one wall. After the painting is done, we just roll up the sheets and secure them up at the ceiling with some tape. Roll them down for the next paint job - easy peasy. And see this hanging basket? 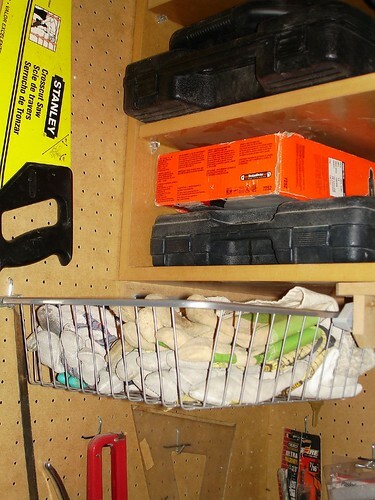 It may just look like a neat storage place for rags and gloves. To me, its a sign that HandyMan does love me. See, I'm only 5'0 and have trouble reaching my garden gloves if they're tucked away in the upper shelves. This little basket was put in just for me, just for my gloves. I guess, even though its definitely "The Boys Room", I'm welcome here too. An estimated 2 million NRIs/PIOs living in Malaysia as the southern cities dominate the demand for investment in residential property in Chennai . Those that have settled across Malaysia and other countries for many years are keen to take a position in their second homes for holidays in states of India. Among the southern cities that driven the demand for investment in real estate Chennai dominate as a result of a mixture of things. 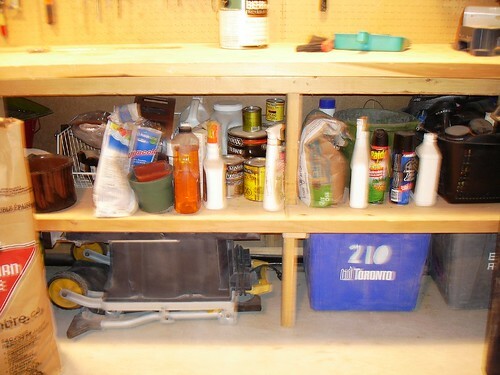 I'm very envious of your organized garage ;). Your hubby did VERY well! My husband is NOT an organizer. He likes to hide things away, but they're not organized where he hides them and he often forgets WHERE he hid them in the first place. 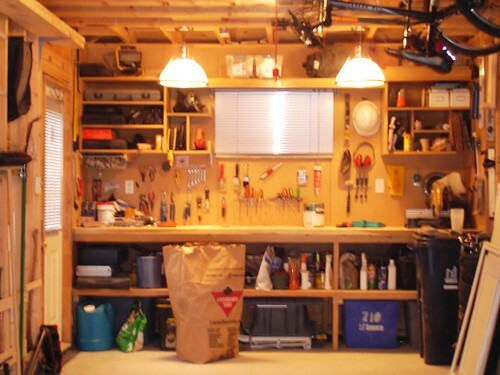 So, our garage, which is full of tools, winter tires, bikes and three hockey bags (two boys and hubby) makes me break out in hives every time I look at it. So I try not to.